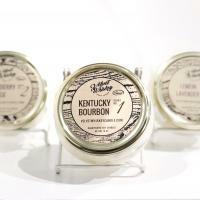 These beautiful candles made in Southeastern, Kentucky are a staff favorite and make the perfect gift! Each scent is hand selected, each candle handpoured and labeled. 10 ounces of all natural soy wax in a small tureen jar with a single cotton wick and a gold lid. Each candle is 100% all natural soy, giving you a longer and cleaner burn. All 10oz candles have an 80 hour burn time! Plus, using soy candles helps support American farmers as well, and we love our farmers! Please tell us in the notes section of your order which scent you prefer.